The product, called EverSweet, got a GRAS stamp of approval in June from the FDA as safe for people to consume in food and beverages. But at a time when foodies and activists around the world debate food origins, labels and health claims, Cargill faces an enormous marketing challenge with its breakthrough ingredient. “This is a society that is sniffing out untruths whenever they can. You have a lot of skeptical consumers,” said Eve Turow Paul, a corporate brand adviser and writer focused on the millennial generation’s obsession with food. Sugar has been a no-no with dieters for decades and it has come under more intense scrutiny recently. Foodmakers reach for substitutes in order to claim products as “sugar-free,” “reduced sugar” and “no added sugar”. EverSweet differs from the ever-growing list of sugar substitutes in that it is the first one made by fermentation to win FDA approval. Its biggest selling point is that it is inspired by stevia, the South America plant that produces a non-calorie sweetener that is 250 times sweeter than sugar. In 2008, after the FDA approved the use of stevia in the US food system, food makers and consumers flocked to it, in part because of its natural origins. 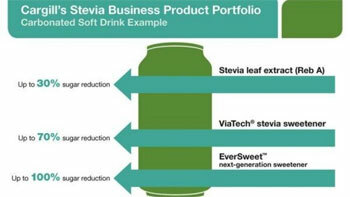 Stevia satisfied both the desire for sweetness and for something natural. Indeed, Cargill’s current bestselling sugar alternative, Truvia, is made from stevia. In the past 12 months, the company sold $98.7-million worth of Truvia in US stores, according to IRI, a Chicago-based market research firm. For all its success, stevia has a major weakness: its distinct aftertaste, often described as bitter or licorice-like, that turns off food makers that are trying to protect their products’ flavours. So Cargill, a global leader in food-ingredient development, began exploring how to make a similar, zero-calorie product that could be produced on a mass scale without altering the taste of foods and drinks. Eight years ago, it partnered with the University of Munich and Swiss biotech company, Evolva, to dig into the molecular makeup of the stevia leaf. The researchers discovered two types of molecules in the plant that, when combined, offer a smoother, bitter-free sweetness that tastes and feels more like real sugar cane than the part of the leaf used in pure stevia products. “People say it doesn’t even taste like stevia, which is a good thing,” said Andrew Ohmes, global product line manager at Cargill who works on EverSweet. The problem, however, is that those two molecules are found in less than 1 percent of each stevia leaf. The company could never farm enough land to make leaf extraction feasible without significant land degradation. Instead the team focused on finding a way to make these molecules in the lab, Ohmes said. Food scientists turned to fermentation. They developed a baker’s yeast that, when added to simple sugars, creates molecules identical to the super-sweet ones found in the stevia leaf. The process may preserve farmland, but food purists have decried the new sweetener and called its comparison to stevia deceptive. US Right to Know, a non-profit dedicated to transparency in the food system, questioned EverSweet in a recent post, calling this process an example of synthetic biology, or “GMOs 2.0” — a reference to genetically modified organisms, which are food products that have been altered to contain one or more genes normally not found in them. There could be benefits to lab-produced ingredients like EverSweet, the organisation said, and then it argued for more tests. Consumer worries about sugar substitutes date back several decades to studies that linked two of the earliest products, saccharin and aspartame, to cancers in lab animals. Years later, those findings were overturned, but the public’s fear remained. Kendall Wallace, a toxicologist from the University of Minnesota-Duluth, said it is unfair to group sweeteners into a single category. They may all strive to have the same effect (sweetness), but that “has little to do with how they actually induce the sweet taste” or whether they have the same “safety concerns.” Each must be examined individually, he said. Debate continues on whether zero-calorie sweeteners help or harm the dieting process, but one of the nation’s leading nutrition scientists, Richard Mattes of Purdue University, said he believes all approved sweetener products are safe. Determining if they’re beneficial, though, requires a slightly more nuanced approach. Sugar substitutes can be helpful for weight management, he said, if a consumer is replacing a calorie-containing product with a non-calorie product. Simply adding a zero-calorie product to one’s diet won’t help. EverSweet is made in a lab, but it mirrors a molecule naturally found in plants, which puts it somewhere in the middle of the food marketing debate. Turow Paul, the brand consultant, said the food debate is frothy and carries risks, but Cargill and its customers who use EverSweet simply need to tell its story clearly. Cargill originally expected to launch EverSweet by late this year, but some unexpected high costs in the supply chain have pushed back its release. Cargill says about 100 companies have samples of EverSweet for tests in products ranging from yoghurt to soy milk to diet colas. The FDA has issued a GRAS (generally recognized as safe) no objections letter for EverSweet, Cargill’s hotly-anticipated ‘next-generation’ Reb D and Reb M sweetener – produced via fermentation rather than from the stevia leaf – qualifying it for use in food and beverages.